Phil Robertson is a part of a majority white supremacist culture? I wish with all my might that I could have a sit down debate with any personality who is apart of MSNBC. It would be like tiger in the meat department at a supermarket. Progressives have this annoying flaw of thinking that they are the smartest people in the room, yet they never are. They lack any common sense in their arguments, so it's impossible for them to make a rational argument. I've done SO MANY stories on the dingbats at MSNBC, I've lost count a long time ago. Since Martin Bashir left in disgrace over his vile remarks aimed at Sarah Palin, I suppose Eric Michael Dyson is trying to become more noticed. Since Phil Robertson has the four taboos working against him in the eyes of liberals 1. Christian 2. White 3. Conservative 4. Male, it's only logical that the whack pack at MSNBC are trying to sink their teeth into him. Eric Dyson in typical progressive racial paranoia template fashion believes that "Phil Robertson is a part of a majority white supremacist culture". As I always say, I couldn't make this up if I tired to. So I am bewildered in trying to find the "white supremacist" angle that Eric Dyson was eluding to. The Shakedown Dynasty: Enter Jesse Jackson. The iconic insult and black eye to Christianity aka Jesse Jackson has been running around the last few days trying to get noticed in the now done and over Phil Robertston, A&E "controversy". Jesse Jackson is no stranger to controversy himself. He as with Al Sharpton always manage to find the supposed racial elements in everything people say yet the masses never seem to notice. And to think, blood hounds are suppose to have a keen sense of smell. Speaking of Jackson, his small band of misfits were picketing outside a Cracker Barrel restaurant yesterday in Chicago, because the restaurant chain reversed it's decision to no longer carry Duck Commander gear with Phil Robertson's face on it. The theme "white privilege" has started recycling itself among progressives in the media. It started when Jackson claimed that Phil Robertson was successful due to "white privilege". I'm not exactly sure how that whole white privilege things works, because if that is the excuse being used by progressives to justify why some blacks don't succeed and move up in life, then how can they explain the countless success stories of blacks who grew up in poverty? Is that black privilege? It's a good thing we have MSNBC to explain to us just exactly that is. I think white privilege has to do with all black people riding the bus and white folks wanting cheap gas. If that sounds looney, don't look at me. Jesse Jackson has a nerve to speak out against anyone. He has zero credibility. His memory must be failing him, because he must have forgotten back in 84, when he referred to the Jews living in New York as "Hymietown"., comments which didn't sit well with the Jewish community. Every time Jesse opens his mouth about Phil Robertson, Duck Dynasty, A&E or Cracker Barrel restaurants, people should remind the fake Reverend that he is a hypocritical joke and needs to sit down, and PAY HIS OVERDUE CHILD SUPPORT! "As a global media content company, A+E Networks’ core values are centered around creativity, inclusion and mutual respect. We believe it is a privilege for our brands to be invited into people’s home and we operate with a strong sense of integrity and deep commitment to these principals. “That is why we reacted so quickly and strongly to a recent interview with Phil Robertson. While Phil’s comments made in the interview reflect his personal views based on his own beliefs, and his own personal journey, he and his family have publicly stated they regret the ‘coarse language’ he used and the mis-interpretation of his core beliefs based only on the article. He also made it clear he would ‘never incite or encourage hate.’ We at A+E Networks expressed our disappointment with his statements in the article, and reiterate that they are not views we hold." What A&E really said was pretty much what I said. 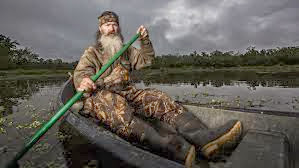 Duck Dynasty makes us a TON of cash, and there was no way we were going to fire Phil Robertson. We might not liked what he said, but we at least gave the impression that we were going to do something about it, but we really weren't and didn't. This is a huge win for not only Christians but for people who have had enough of the vocal minority trying to silence the silent majority. The lesson that should be taken away from A&E and also Cracker Barrel caving is that the silent majority in America can accomplish great things when they stop being silent and open their mouths to fight back. Phil Robertson vs the Rainbow Mafia. You have to laugh when liberals pat themselves on the back in their self grandstanding and fraudulent claim of being the champions in supporting diversity. Diversity is more then just the color of a person' skin. It's also about having different points of views, beliefs, morals etc. Progressives refuse to accept that notion however. Their idea of diversity is people of different races all embracing the progressive points of view, period! The militant homosexual groups and their supporters known as the gay mafia or rainbow mafia talk a lot about no hate aka "H8" as they put it, yet they seem to have no problem hating anyone who doesn't support their point of view, when it comes to homosexuality and gay marriage. Duck Dynasty star Phil Robertson found out just how intolerant the rainbow mafia is. Phil gave a sit down interview with GQ magazine. He was asked about his view on homosexuality. Everybody who knows Phil and the rest of the Robertson family knows that they are very devout Christians. Well Phil made the mistake of being honest about his views and he paid the price in this political correct, knee jerk easily offended society. This move by A&E has created a firestorm backlash against them and the gay group GLAD for obvious reasons. I'm going to be talking more in detail about this story, because I have a disdain for the rainbow mafia fro always trying to smear anyone who doesn't embrace their lifestyle as being "hateful". Nice fingernails, foodstamps and racism oh my!! The left claims that they do not support stereotyping or profiling of others. As usual, the facts are like a hot knife to their butter. It's no secret that the welfare program is in serious need of reform and the need for fraud safeguards to be established and enforced. Whenever a person talks about the need to overhaul the system and cut the fraud and abuse out of the system, it's without fail that liberal activists and liberal politicians cry that this is merely an attempt by the right to negatively impact "black people". Liberals claim they want a color blind society, yet for some reason they always manage to see the color black in everything. Of course there are more whites on welfare then blacks simply because there are fewer blacks in the population, it doesn't stop the left form pimping the black card whenever possible.I like Chris Mathews of MSNBC, well not really. I mean I like him as if I was watching a goof ball on television, his absurdity and insanity makes me laugh. It's impossible to take a person like him seriously. He's a dunce. This is a white guy who barks racism as much as a dog barks at the mailman. I remember during Obama's first State of His Lying to the Union Address, Chris stated that "he forgot he forgot Obama was black tonight". He must have forgotten his glasses.It could have been Obama's white half Chris was looking at that made him forget I guess. MSNBC is known as "all race all the time" for a reason. They are "obsessed" with Obama's skin color and anyone who dares to disagree or not even like him. Well now Chris's racial paranoia has extended to the realm of Food Stamps. Chris Matthews played an audio clip of Lee Bright who is a Tea Party conservative who is running against Sen. Lindsey Graham for his Senate seat in South Carolina. At a fundraiser in Oklahoma, Mr. Bright said people in food stamp lines often have their nails done, have nice wallets and nice cars. Mr Bright never made any reference of race but leave it to Chris Matthews and his guest Michelle Goldberg to "fill in the blanks or hear the racial dog whistle" of course. I'll let you all in on a dirty little secret. There are people who wear nice clothes, have painted finger nails and are dropped off and picked up in nice cars. Hell, many have Iphones, Android smartphones and freezers full of the best quality meats tax payer money can buy. It's a thing called "fraud and abuse". Chris & Michelle wanted to make this about Mr. Bright and conservatives on how they view people on welfare but this is their stereotype. Again, let a conservative or a Republican congressman or Senator mention cutting welfare and see who are trotted out as political props by the left as who the cuts will impact them most. They will display blacks, females and children, their typical M.O. Saying Obamacare is the same as using the "N" word? Liberalism is a mental disorder. Over the many years I've dealt with the tin foil hat hate brigade known as the progressive left, I come to realize that the term liberalism is a mental disorder is indeed accurate. Progressives have been saying some of the most outrageous, ludicrous, insane, ridiculous and just flat out bizarre comments for as long as I can remember. Over the past five years of Dear Leader aka Obama, some of his supporters have up their insanity and cut back on their psychiatric meds. If anyone dares utter an unkind word about Obama, the left will foam at the mouth like a bunch of mad dogs with rabies. One of the most concentrated sources of unhinged irrational thought is over at MSNBC. I've talked about the kooks on that channel for years, and nothing has changed. Here's an illustration. We all know about the stark raving loons such as Chris Matthews, Toure, Ed Schultz and formerly Martin Bashir, but there are others as well. Melissa Harris Perry should be a candidate for electroshock therapy, because clearly this is a woman who's thinking isn't in sync with reality. I don't really care that she's a intellectually deficient slap happy twit, the shocker is that she is a professor at Tulane University. Now you know why so many young people are as clueless as clueless can be. A few months ago when Texas passed a ban on late term abortions after six weeks, progressives threw a fit over what happened. 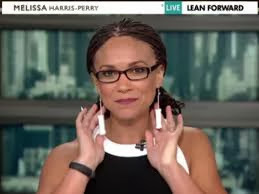 Melissa Harris Perry decided to do her own protest on air by "wearing tampon earrings". It's a shame MSNBC can't wear some tampons to stop their ratings from bleeding.MSNBC just can't seem to figure out why Fox News always destroys them in the cable news rating, gee I wonder why? Anyways, Melissa has had enough of the evil racist right wing referring to Obamacare as Obamacare. When it comes to the absurdity of liberalism, I couldn't make this stuff up if I tried. The name of the law is the Patient Protection and Affordable Care Act. Let's be real, how many Americans can remember all of that? So they all call it Obamacare for short. Since the roll out of Obamcare, it has been ripped to shreds not just by the right but also by the left. Who said that the right and the left couldn't see eye to eye on things? The left's only defense of Obama is to call anyone who disagrees with him on policy or ideology a "racist". Just imagine what the defense script will be if Hillary is elected in 2016. Anyways, Obama's supporters have been saying that the right has been using "racial code whistles" in attacking Obama such as using the words "Chicago","Socialist", "Community Organizer". As a black guy, I might need to clean my ears out, because I can't seems to hear these whistles that only the far left tin foilers seem to able to hear. Getting back to Melissa Perry Harris, she's is now mad as hell, and she wasn't going to take it anymore. You see, in Melissa Perry Harris's world, saying Obamacare is the equivalent of a person using the "N" word. I want everyone to watch her meltdown from beginning to the very end. This goes back to why liberalism is truly without a shadow of doubt a "mental disorder". The $15 an hour march towards the impossible. The other day, I went into a local Burger King, and, I noticed that the prices on the menu were ridiculous. All I wanted was a Whooper. Fast Food prices in general have gone up over the years mainly, because labor costs have risen. This is the consequences of constantly raising the minimum wage. I wrote a few months ago about the misguided attempts by some fast food workers attempting to strike their way to fifteen dollars an hour. Thursday was the day in which fast food workers walked off of their jobs in 100 cities in what was called by the unions as a day of protest. I'm not exactly sure how many workers either walked off or didn't show up to work on Thursday due to the strike, but any of them who did do it should have been fired the next day for "job abandonment". There is a little fact that the malcontents didn't comprehend, when they went on their one day strike. They weren't members of a union, so they didn't have the right to strike. In the video, I find it ironic and funny that a member of the Media Research Center interviewed a "Community Organizer dressed up as a clown". Liberals wanting something for nothing doesn't surprise me. That is what they are all about. Many liberals thought that Obamacare was going to usher in the era of free health care, wow they thought wrong on that. Fast Food restaurants pay low wages for a very simple reason. Those types of jobs do not require a formal education or a specialized skill to perform. Anyone using liberal logic doesn't see reality that way. They want to be paid what people who have specialized skills or formal education get paid. Now common sense would say that fast food workers should simple get a marketable skill that is in demand and make fifteen dollars an hour or more the common sense way. Again, it comes back to the get something for nothing mindset, Of course these brainiacs aren't exactly knowledgeable on how business and economics work. This is CONgressman Keith Ellison of Minnesota speaking at a Fast Food Rally calling for Obama to use an Executive Order to raise the minimum wage. Keith is good a political grandstanding and blaming all possible ills of the poor, the suffering etc on the GOP. What he's not good at is telling the truth to the people. The truth is that raising the minimum wage or giving Fast Food Workers $15 an hour isn't going to lift these people out of poverty nor will it give them that illusive "living wage" they claim they want. The unions, mainly the Service Employee International Union SEIU, are behind these rallies and staged strikes. This isn't some grand national grassroots uprising by fast foot workers. It makes for a great story line though. With union membership in a deep decline, the fast food industry is just another target for the unions to try and latch onto while using the fast food workers as pawns dangling that $15 an hour pipe dream carrot in their faces that will never get. 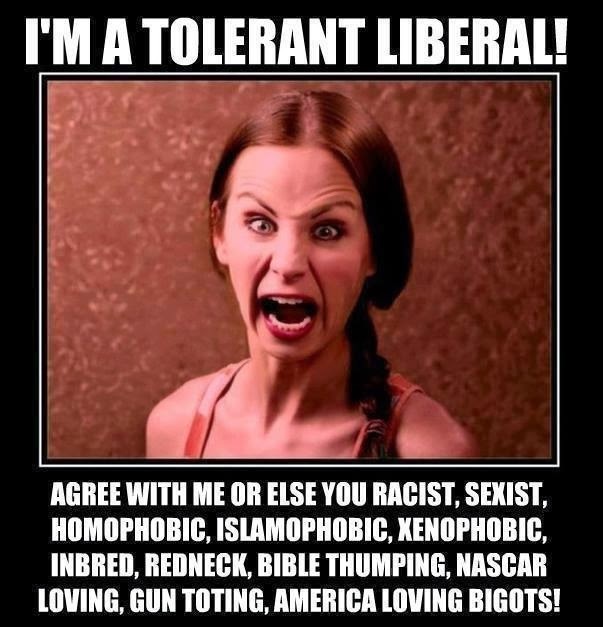 Liberals embrace tolerance as long as you agree with them.